Addis Abeba will receive 500 additional bus shelters before the end of the current Ethiopian year at a cost of 156.6 million Br. Jiangxi Water & Hydropower Construction Company secured the contract for the second phase of the project and started construction last September. The project, managed by the city Transport Authority, is expected to be completed in mid-2019. The company won the international competition, which also included local contractors. "The Ethiopian construction companies offered double the price compared to the winner," Dawit Zeleke, director of the Authority told Fortune. "This has made us award the project to the foreign company." The Authority installed the same number of shelters a year ago at a cost of 93 million Br, which was also contracted to the same firm. The construction is the second phase of the plan to build 2,000 bus shelters in the second edition of the Growth & Transformation Plan (GTP). When completed, the shelters can serve up to 20 people at a time and will be located on major roads of the capital. The shelters are built targeting commuters that use the two state-owned bus companies, Anbessa City Bus Service Enterprise and Sheger Mass Transit Service Enterprise, the privately-owned Alliance Bus company and taxis. The city needs at least 17,000 public vehicles to satisfy demand, according to the city's Transport Authority. The government has only met 69.7pc of this demand. "The shelters have different features compared to the existing ones with slight design improvements," said Dawit. The shelters come with two options: with and without the bench seats. Also, in congested areas of the city, the bus stop shelters will come without walls, enabling people to pass through them when the sidewalks are narrow. "Forty percent of the total shelters are completed in this way to serve this purpose," Dawit said. The remaining shelters are being developed in the style of the first phase of bus stops. The first phase created employment opportunities for 250 women to clean the shelters. In addition to this, the Authority collected eight million Birr from advertisements on the bus shelters. The women also will be given the opportunity to take care of the new shelters when finalised, according to Dawit. The project is also aimed at replacing the old shelters that were built by various actors over the years. 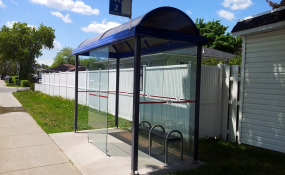 The newly built shelters are handicap accessible and set back at least one metre from the roadway. While road networks are growing by about 10pc each year, 60pc of the 900,000 vehicles in the country are found in Addis Abeba, lending itself to heavy road congestion, particularly during rush hours. A shortage of transportation vehicles to satisfy the city's transportation demand during peak hours, the lack of adequate traffic control facilities, high traffic congestion and inadequate and deteriorated urban road infrastructure are problems that need to be addressed by the city. One urban transport expert with a decade of experience applauds the quality and aesthetic values of the shelters but suggests a diversification of the facilities. "As the shelters are used for mass transport, the capacity of the bus shelters should be improved to host more people," said Birhanu Zeleke (PhD). The City Transport Authority collected 14 million Br from services, fines and registration fees last fiscal year. Currently, 2.8 million people use the public transportation system daily.